Join the connected world with your Denon AVR-E300 A/V receiver, which features network connectivity that lets you enjoy music from sources such as Pandora, SiriusXM and Spotify and view your favorite photos via Flickr. The AVR-E300 also features AirPlay for streaming from your favorite iOS device, such as an iPod touch, iPhone and iPad. 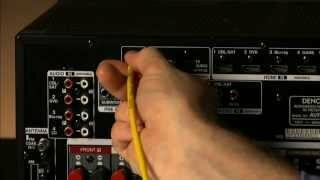 For easy, fast and accurate system setup, the AVR-E300 features our acclaimed Setup Assistant with simple to follow on screen setup instructions. 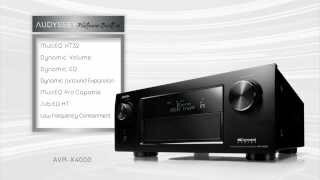 Find out what others are saying about the E-series Home Theater Receiver, here. Simple, Denon Easy Connect speaker terminals. Audyssey Bronze is our entry level of support for Audyssey technologies and includes Audyssey MultEQ, Audyssey Dynamic Volume, and Audyssey Dynamic EQ. Audyssey MultEQ calibrates the system for as many as six different seating positions; essentially everyone gets a “good seat”, not just the lucky person sitting directly in front of the display. 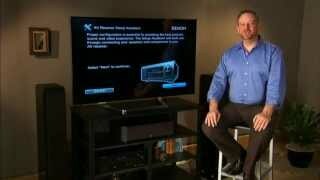 Its use greatly improves the sound quality of any home theater system. Audyssey Dynamic Volume senses the impending arrival of very loud sounds and automatically reduces the difference between normal and extra-loud programming. Audyssey Dynamic EQ automatically adjusts subwoofer and surround speaker levels for maximum performance at any playback volume. For quick and easy setup the AVR-E300 features Audyssey MultEQ automatic room acoustic measurement and correction system to provide best tonal balance to your listening environment, along with Audyssey Dynamic EQ and Audyssey Dynamic Volume for thrilling surround sound even at the reduced volume levels. Setup is a breeze, thanks to the on-screen graphical display, which combines large, clear text and icons, so you can easily make all necessary adjustments and settings during setup, to quickly and easily optimize the AVR-E300 for your particular speaker setup and source equipment. 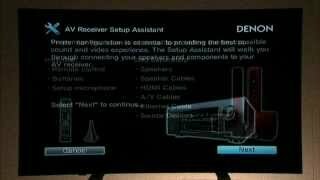 The exclusive Denon Setup Assistant easily walks you through the whole process. The Denon easy connect speaker connections on the rear panel are spring loaded and color-coded for quick and easy connection, and the supplied color-coded speaker cable labels ensure correct speaker cable hookup the very first time. The easy to use remote control features discrete source selection buttons that let you choose your preferred source with the touch of one button (no need to toggle through all the inputs to get to your preferred source component). A hallmark of Denon’s legendary sound quality is the use of identical power amp circuitry for all channels, including our all-discrete power amplifier output stage design. Rated at a maximum of 175 watts for each of the 5 channels, the AVR-E300 provides high power and wide dynamic range with low distortion for a superb surround sound listening experience. The AVR-E300 is equipped with 5 HDMI inputs including 4 on the rear panel along with 1 on the front panel, which lets you quickly and easily connect your HDMI-equipped camcorder, smartphone or other portable multimedia device. With HDMI Standby Pass-through, you can enjoy a program from your cable or satellite tuner on your TV without the need to turn the AVR-E300 on, which is ideal for casual viewing of newscasts and the like. The AVR-E300 can be controlled using your iOS or Android mobile device. Using the Denon Remote App, you can control almost every aspect of your multimedia experience, including browsing Internet radio and files on a media server, playlist creation, volume, input selection, surround sound modes and menu navigation. The receiver measures 6 x 17.1 x 13.2 inches (H x W x D) and weighs 18.1 pounds. The AVR-E300 is backed by a two-year limited warranty, subject to the full warranty terms and conditions. AVR-E300, setup measuring microphone with attached cable, remote control, 2 AAA batteries, FM antenna, AM loop antenna, CD-ROM Owner’s Manual, Quick Setup Guide, color-coded speaker label tags, warranty information sheet.